Southern Cross' for Tuesday August 11th 1863. In each list some of the spellings are different. Both are given below. down and obtaining the photograph of the 'Queen of Beauty'. 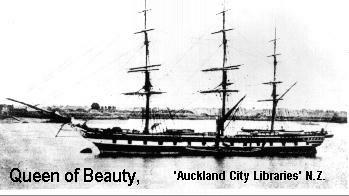 Reproduced with permission of Auckland City Library. William P Mountstevans, Frederick E. Rosser, Charles S. Clark,, Miss Wood. Jane, Mary Ann,, John, Elizabeth, Thomas, Mary Ann and Joseph Wyatt. Edith, Alfred, Maude and Florence Nicholson. David, Helen, Margaret, James A. and Andrew B. Philp. Edward H. and James C. Jackson. George H. and Susannah Bruce. George, Ann and Robert Sudlow. James , William, Margaret Jane, and  Robert Turrell. James, Mrs John, Jane and John Hamilton. Samuel T. and Anna R. Smardon. Thomas and Mrs. Pickston and child. Cornelius, Mary, John, and Ellen Reilly. Henry H. Rebecca, and William H. Grant. Richard, Isabella, Augusta and Amelia Franklin. Daniel, Mary Ann and James Horn. Jeremiah, Margaret, Frederick and George Horn. Richard, Richard J. , Arthur and Henry Pearce. Robert, Susannah and infant Mickalls. Ann, Margaret and Thomas Franklin. John, Annie, Arthur, Margaret, Elizabeth, Jane, John and Alexander Tilly. Elizabeth, Mary and Sophie Brunskill. descendants of a few of the  'Queen of Beauty' passengers other than the Philps. If you know of any please contact me. Link to the main index of the Bowie Story. Link to the next part of the Bowie/Philp Story.